I have two teenagers in highschool and they say that breakfast is one of the most important meals of the day. Sometimes I feel like this one of the hardest meals because my kids literally get up so early that they are always rushing around. It’s really one of the busiest times of the day. So I started getting creative with semi homemade meals. 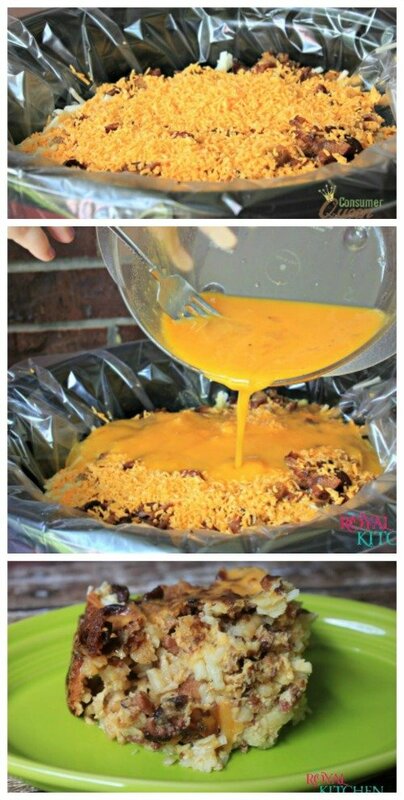 This Crockpot Breakfast Casserole can be made the night before and is done first thing in the morning. So even if thy get up before me they can simply lift of the lid and scoop it out themselves and mom gets an extra hour of sleep! 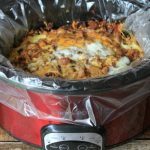 If you like our Crockpot Breakfast Casserole recipe you will love our Loaded Baked Potato with Sausage Casserole Recipe, BACON MAC AND CHEESE WITH GRUYERE and French Toast Bake recipes. 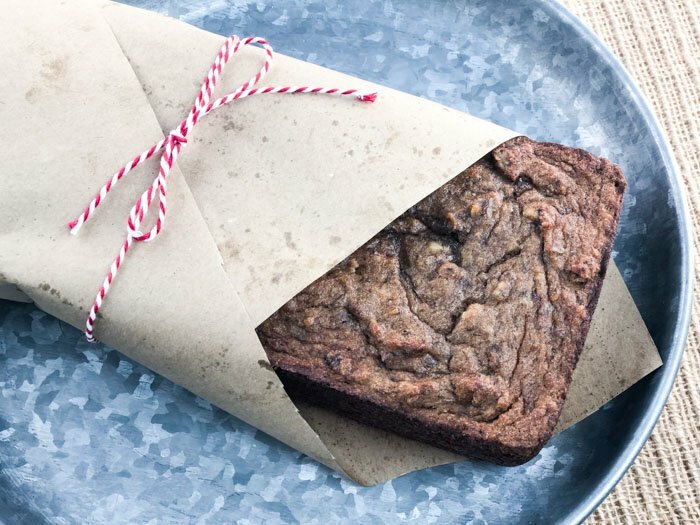 Don’t forget you pin these posts to your Pinterest and add them to your FREE Recipe Box. 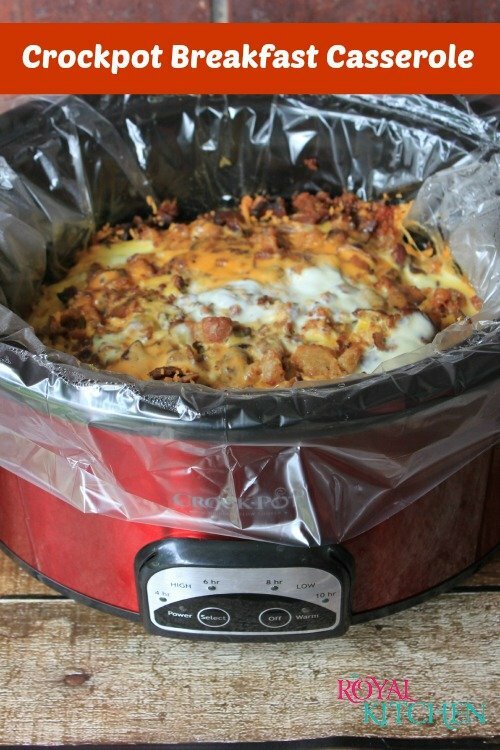 Place crockpot liner in your crockpot and spray it with olive oil. In a medium bowl mix eggs, garlic, salt, pepper and milk together. Cook on low for 7 to 8 hours. If you start this around midnight it will be done when you wake up in the morning. 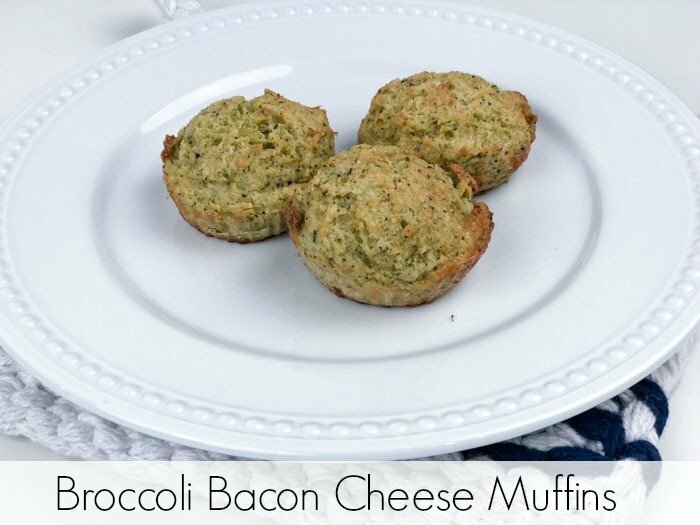 Make these healthy Broccoli Bacon Cheese Muffins for a side to your week-night dinner! Do you cook the sausage and (especially!) the bacon before layering? If not, doesn’t the bacon end up limp and unappetizing? Yes you do! Sorry I will add that to the recipe! Thanks for bringing that to my attention! Are the sausage and the bacon pre-cooked before going into the crockpot? Looks delicious…thanks! Do you pre- cook the bacon and sausage? I honestly haven’t tried but you could do it in 2 crockpots at the same time. what can I use if I don’t have a crockpot liner? The recipe says “¼ garlic powder”. I take that is 1/4 tsp. of garlic powder, correct?